Hornblower Cruises recently outfitted two new catamaran boats with new One Systems sound reinforcement systems to accommodate the regular tours of Niagara Falls, as well as special events that the company offers. NIAGARA FALLS, ONTARIO, CANADA—Experiencing the power of Niagara Falls from a boat is breathtaking. The sheer power of the water and mist is one of the wonders of the world. Hornblower Cruises recently received exclusive rights to operate Niagara Falls boat tours from the Canadian side of the falls. 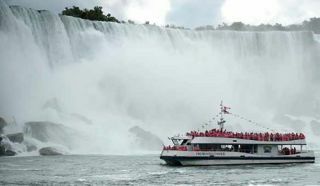 Two new 700-passenger, catamaran boats take passengers on the “Voyage To The Falls” which includes a journey past the American Falls, Bridal Veil Falls, and into the very heart of the famous Horseshoe Falls. During each tour, the poncho-equipped passengers are treated to an audio presentation that covers the history and background of the area and music playback during their journey. To ensure that every customer receives the best experience possible, Hornblower Cruises installed new sound reinforcement systems in each boat to accommodate the regular tours as well as special events that the company offers. Design Electronics, located in Niagara Falls, Ontario, Canada, has a long history of installing and maintaining audio systems used on the Niagara cruises. As a result, they were brought in to assist with the system design for the new Hornblower boats. Working with a base design and specification created by the U.S.-based Hornblower AV department, they were tasked with putting together a system that would meet the current and future needs of the Niagara Falls organization, as well as one that could survive the rigors of the elements. Given their experience, Design Electronics recommended One Systems direct weather loudspeakers for the job. The distributed 70-volt system consists of 38 One Systems 103IM high performance loudspeakers powered by Lab.gruppen amplifiers. System control is provided via a Rane HAL2 system. The main level of each boat features a covered outdoor observation deck and a central enclosed room for those seeking protection from the elements. Stairs provide access to an open observation deck on the second level. The majority of the 38 103IM loudspeakers are bracket mounted throughout the main level to cover passengers on the open deck and in the enclosed seating area. The low ceiling height and a desire to keep the views as un-obstructed as possible made the compact, eight- by six- by five-inch enclosures a perfect fit. Additional 103IM loudspeakers along with Community Professional R-Series loudspeakers are bracket-mounted on the mast to cover the open observation areas on both levels. For zoned system control, Design Electronics suggested a Rane HAL2 DSP along with Rane’s RAD2 (wall-mounted Remote Audio Device performing A/D and D/A) and DR3 (wall-mount digital remotes to control audio). RAD2 input panels, installed via Cat-5 in different areas of the boat, offer xl r, RCA, and 3.5mm connectivity. Wall-mounted DR3 remotes allow Hornblower employees to easily control different input sources and levels of each zone from various locations on the boat. The HAL2 is rack mounted with eight Lab.gruppen E Series amplifiers. Four E12:2 power the 103IM loudspeakers, two E8:2, and two E4:2 drive the loudspeakers on the upper deck. Both of the Hornblower boats launched in April of 2014 and have not stopped going since then. Bjorgan noted that One Systems and its Canadian distributor, Contact Distribution, were integral to getting the components delivered so they could be installed within a tight time frame. According to Bjorgan, the organization is very pleased with the end result.